Jane Austen’s last complete novel is now available in a revised Norton Critical Edition. The volume emphasizes new trends in critical discourse, which have enormous importance for our understanding of Austen’s achievement. Sense and Sensibility is Austen’s first published novel and the one now most scrutinized by historicist and feminist scholars, who offer new, complex readings of the work. Northanger Abbey, written in Jane Austen’s youth and posthumously published, is arguably her most mysterious, imaginative, and optimistic novel. 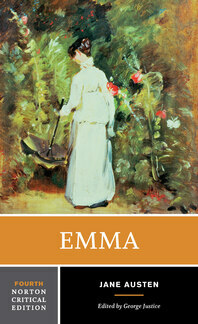 Jane Austen’s beloved comedic novel is now available in a revised and updated Norton Critical Edition. The text of the Fourth Edition of the Norton Critical Edition of Emma is based on the 1816 edition published by John Murray. George Justice has lightly and judiciously emended the text for faithfulness and clarity. The novel is accompanied by detailed explanatory annotations as well as facsimiles of the 1816 title and dedication pages. “Backgrounds” collects a wealth of source material, much of it new to the Fourth Edition. New material includes Austen’s correspondence with her publisher about the business of writing, revealing Austen’s view of her own writing and career. In addition, there are two sets of verses—“Kitty, A Fair But Frozen Maid” and “Robin Adair”—referenced in Emma as well as responses (1815–1950) to Austen and her writing from, among others, Charlotte Brontë, Juliet Pollock, Virginia Woolf, D. W. Harding, and Edmund Wilson. “Reviews and Criticism” includes twelve major interpretations of the novel, nine of them new to the Fourth Edition. New contributors include Jan Fergus, Patricia Meyer Spacks, Tony Tanner, Maaja Stewart, D. A. Miller, Emily Auerbach, Gabrielle D. V. White, Richard Jenkyns, and David Monaghan.